The average weight of ham is 11 lbs. 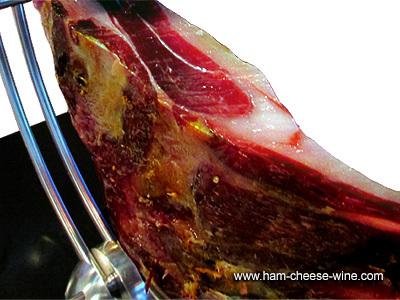 An Iberico Shoulder Fermín is a special way to enter the fabulous world of the Spanish hams in the U.S. It is obtained from the black Iberico pigs fed on high quality grain and cereals. Iberico Shoulder Fermín meat is rich in unsaturated fatty acids so it is favorable to maintain low blood cholesterol levels, is healthy, at the table is a delight for your palate and is compatible with any diet for being a low calorie food. About Iberico hams and specifically about the Iberico Shoulder Fermín, you can tell that it should be distinguished by its quality, derived from the purity of the breed of black Iberico pigs, reared in a free breeding regime, in La Alberca, Salamanca. They are fed on high quality grain and cereals for getting optimum product performance and ham curing, which usually extends to 24 months. This ham is distinguished from the rest for being the result of the perfect alchemy and the experience of the ¨Maestro Jamonero”, that manage to achieve a texture, aroma and a distinguishable flavor in all kind of hams of the Fermin brand. The Iberico Shoulder Fermín is different from Iberico Shoulder de Bellota Fermín, although both come from the same breed and quality of Iberico pigs, its unique flavor is due to the food supplied to pigs, in this case natural cereals and not of acorns. It is characterized for having more fat than the acorn, but its flavor is delicate and pleases to palate. The Iberico Shoulder Fermín is obtained from the shoulders, the front legs of the animal. If you do not want the whole leg, this piece already cut is a good choice for small families or intimate meetings that you want to impress with a delicacy to your guests. The selection of pigs from the purity of the breed is essential to obtain a product of unique quality and flavor like Iberico Shoulder Fermín since this depends on the properties of the flesh. The Iberico pig is unique in the world because in their muscles and under skin occurs unsaturated fat infiltration and feeding determines the taste and texture of it; these pigs are fed on grain and herbs from the pasturelands where the pig stand out freely. Ingredients: Iberico Pork, salt, seasoning (sugar, sodium citrate, potassium nitrate, sodium nitrate). Gluten Free. 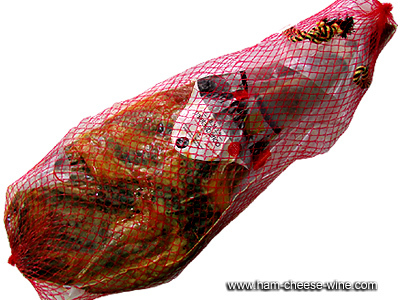 cutting, use the fat that has been removed to protect the cut surface of the ham and to prevent drying. Then cover with a clean cloth. If the product is not maintained properly once cut, a layer commonly known as white mold may appear. The Iberico Shoulder Fermín should be hanging vertically because this help to keep fat infiltrating in the direction of the fibers, following the natural position of the leg of the Iberico pig. It is also better to use dark environment rather than very bright. To make the cuts, you must have the necessary tools, such as flexible knives and ham broadleaf knives, trying to avoid blunt knives. 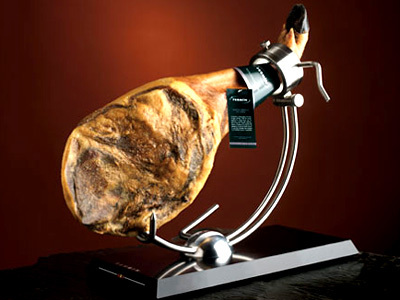 The taste of an Iberico Shoulder Fermín depends on the art to cut the iberico ham. 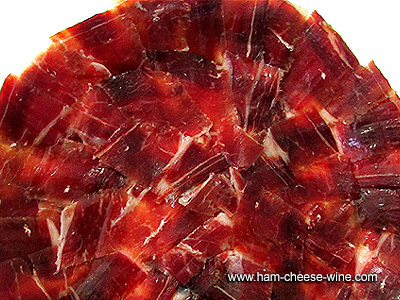 With a fine cut almost transparent, always the flavor of the iberico ham will be better. The cut must be made uniformly from top to bottom or vice versa across the width of the Iberico ham in order to cover the plate, thus keep better slices texture. Once the first cut on the Iberico Shoulder Fermín is made, save the fat from the shoulder to smear over the cutting parts to prevent the salt come off the surface, this will retain the aroma and flavor. 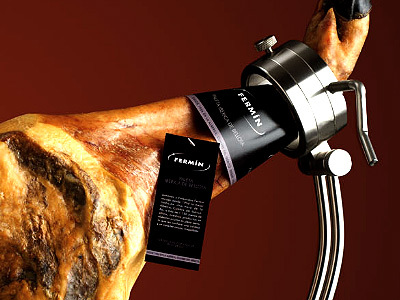 Do not freeze neither an Iberico shoulder Fermín nor other cured ham, as the cold alter or disappear aromas and flavors. Freeze means additionally introducing water into the fibers of the structure of the slice, water expands into the freezing process, and may occur physical changes to the meat of the Iberico shoulder Fermín. To keep the ham is also recommended to smear over the cutting parts either with the grease of ham or olive oil to prevent the salt come off the surface. Because of the quality of an Iberico shoulder Fermín, it is a food treasure that you should take care and preserve. The objective is to retain all the characteristics of the iberico ham, the aroma, flavor and texture, from beginning to end. Just like all Iberico hams, the Iberico shoulder Fermín has characteristics white streaks, typical of the Iberico pig meat. If you see small white dots, do not worry, they are the result of the crystallization of an amino acid called tyrosine, this is a sign of quality, confirms the low salt content and slow natural healing in the warehouse, and this is one of indicators of quality and excellence of the product. The fat must be soft, yellowish on the outside and give way under the pressure of the finger. 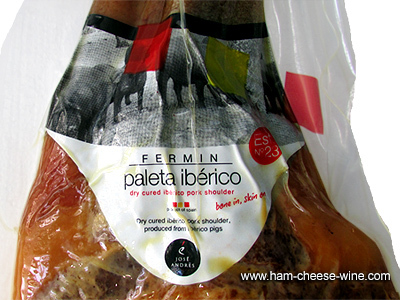 Why Iberico Shoulder Fermín is a so special product? The Iberico shoulder Fermín is within the Iberico ham group, it has beneficial properties to health and nutrition of the people and it is suitable for almost any diet, being low in calories. According to studies conducted in California, the Iberico ham has zinc in a ratio of about 2.3 mg per 100 g of ham, this mineral is very important in the diet of young and adults; it improves mental activity, enhances the immune system and decreases atherosclerosis. 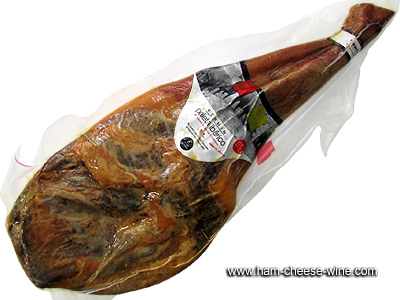 All this makes of the Iberico Shoulder Fermín an ideal item for your diet. The unique quality of the Iberico Shoulder Fermín is the result of a careful selection of pure breed Iberico pigs, reared freely in the pasturelands of La Alberca and fed on high quality grains. 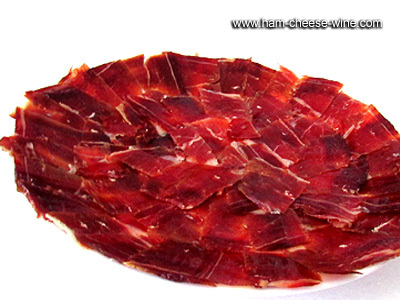 For this selection, the “Maestro Jamonero” is responsible for choosing those pieces that meet all the organoleptic qualities that characterize this top quality product and work with each piece of ham in a particular way to achieve quality results that make of each ham the most coveted delicacy of the Spanish culinary arts. The Iberico pig fat contains about 50% oleic acid (monounsaturated). According to rigorous scientific studies, consumption of these fats produces a beneficial effect on blood cholesterol by increasing the rate of good cholesterol (HDL) and regulating the rate of bad cholesterol (LDL), surpassed only by virgin olive oil with higher oleic acid content. The Iberico Shoulder Fermín also provides protein, vitamins B1, B6, B12 and folic acid, very beneficial for the nervous system and contributes to the well-functioning of the brain. It is also rich in vitamin E, a powerful antioxidant, is rich in other minerals such as copper, essential for bones and cartilages, calcium, iron, magnesium and phosphorus and selenium that is closely linked to aging processes. The iberico shoulder ham designation has also obtained the recognition of the EU as a Traditional Specialty Guaranteed (TSG) and entered in the Register by that name according to Regulation 2419/1999. This product has been recognized as the first Traditional Specialty Guaranteed of the Spanish food industry. This iberico shoulder Fermin special traditional Spanish dish is considered a product of the highest quality food. The company “Embutidos y Jamones Fermín” is a unique project founded in 1956. With a long tradition of knowledge that has been transferred from generation to generation, it has managed to become the first breeding farm for the selection of the pure black Iberico pig, where these animals find food that helps them to achieve the quality of their products. FERMÍN brand with a tradition of more than half a century exporting its products to many countries imposes the quality of their products quality and style of work that has provided countless awards, as well as the award for "Best Spanish Food Company "in 2006.